Teachers are some of the most remarkable people on Earth and they give back to society in ways most of us will never even understand. As these wonderful individuals head back into the classroom for another school year, we want to offer our list of must-have school supplies for teachers. We are constantly seeing new products hit the market with helpful new features and creative twists on age-old school supplies. Not only are these items fun, they can be great tools in the classroom. TeacherPro Electric Sharpener: For many teachers, pencil sharpeners are seen as a necessary evil in the classroom. Traditionally, they are loud and distracting and have the potential to make huge messes. However, this sharpener solves many of those issues. It is made with a quiet motor and engineered to turn off and illuminate a light when the pencil is sharp. It also has a ingenious mechanism that won’t allow it to start until the shavings receptacle is in place. In 2010 this product won the Teacher’s Choice Award…so it’s already teacher approved! Easy Erase Pad:Every teacher has battled stubborn dry erase markings that won’t come off or an accidental permanent marker ink on a desk. The easy erase pad is absolute magic. This isn’t just cheap words to push a product, I’ve tried it myself on a number of surfaces and it works fabulously. 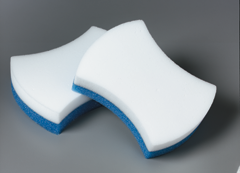 Simply pour a little water onto the white side of the pad, let it soak in and erase away. Zip Notes: Sometimes one sticky note just isn’t enough. With this battery operated dispenser you can create any length sticky you need. Just press the button and out comes your sticky notes. You can even make a banner length sticky note if you want. 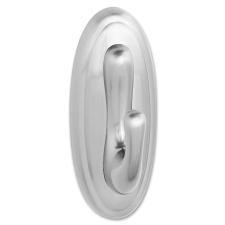 5 lb Command Hook: These durable, removable mounting hooks have so many uses every classroom needs at least one. Stick it on the side of your desk to create a hook for your purse or mount it on the wall as a coat hanger. You can also use these hooks to mount or display posters and signs around the classroom. The brushed nickel finishing gives it a classy look that blends in better than the traditional white plastic finish. 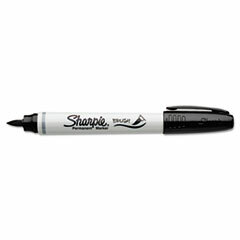 Brush Tip Sharpies: Another great new addition to the Sharpie line comes the brush tip. These markers are especially good for art projects as they offer a range of different strokes. The brush tip creates an almost paint brush like effect and feel, allowing you to really put your artistic skills to the test. Feel free to contact your FSIoffice representative for more information and pricing on these must-have products. Love this post! I’ve never seen the Zip Notes before, but think it would be awesome in my classroom. 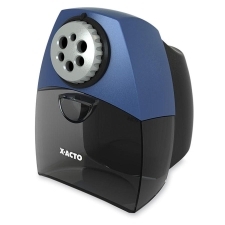 I own the Teacher Pro pencil sharpener and I love it…When you have a lot of students sharpening pencils this is the sharpener to own! Now I want to try the easy erase pads. Of course the sharpie is a staple in every teachers classroom. I love all these products you showcased! 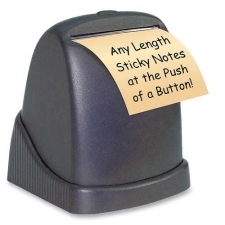 I have never seen the machine for sticky notes-that really looks neat!